In case anyone didn't see my little conversation on Twitter, I have decided to complete all the partially-completed projects in my workshop, including the Alexander McQueen tribute piece, the Chimæric cutlery, the rolling teapot, the piece for Annie Ross, 20000 Leagues and all the rest before even thinking about starting anything new, commissions excepted. I started today with this (above). 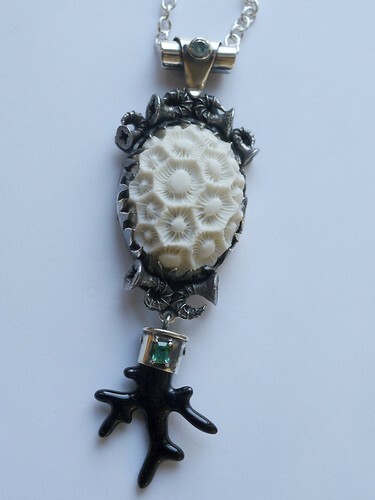 This is "Deep Sea Sketch", a kind of outline piece I started before beginning on "20000 Leagues Under The Seas" and another piece made around porcelain faux corals by Lisa Stevens. The idea for using the screws like little shells came from one of my students in Turkey who curled up some longer ones to great effect. The stones are natural blue zircon and tsavorite garnet.